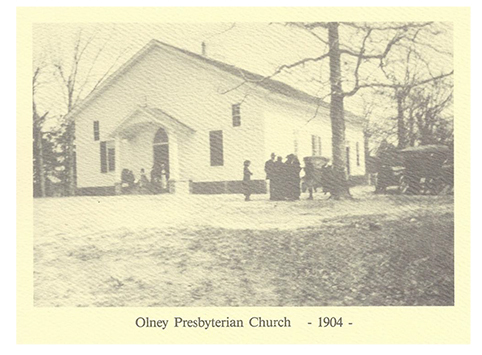 Olney was founded in 1793 by members of Bethel Presbyterian Church located in York County, South Carolina who lived in the Gastonia area of North Carolina. Bethel had been founded by the Scotch-Irish immigrants who came southward primarily from Pennsylvania. In the days where transportation was by horse or horse drawn vehicles, the distance to the Bethel church from their homes was difficult. The separation occurred because of this and possibly some internal dissension. The first minister known to have been associated with group was the Rev. W. C. Davis. The first meetings of the congregation were in a temporary open-sided structure fashioned from a network of poles and covered with a dense layer of branches, leaves, vines and other vegetation for a roof. This was the brush arbor and was used for shelter from the cold and rain, primarily during the warmer months. Seats were fashioned from hewn logs and preaching services were conducted in a camp meeting type setting for a week during the summer. Church members were still scattered over a wide area, many living eight miles away. During winter months attendance was sparse, but during the summer months of July and August revival meetings were held. Members came and attended services for days at a time in a camp meeting type setting. Additionally when held, regular services were usually for two days at a time as indicated by Session accounts for both Saturday and Sunday. The first reference to this congregation occurs in the minutes of the Presbytery of South Carolina when Rev. James McRae offered a resolution to allow Orange Presbytery in North Carolina to take Olney under its care. This is dated Sept. 25, 1794. Two log buildings were subsequently built on the property although the actual dates of construction are not known. There were actually two worshiping communities (North Bethel and Independent Presbyterian) on the site. When held both worship services were at the same time. Regular services were not held at this point in time as ministers often served more than one area and traveled between them. The Concord Presbytery was formed in 1795 and apparently the Olney (formerly North Bethel) congregation transferred to it as the Concord Presbytery held its meeting there in 1798. For much of the early history of Olney the pulpit was reported as vacant. What is termed the first permanent building was constructed on the site and dedicated in 1860 by the Independent congregation with the Rev. Robert Y. Russell preaching the sermon. It was a white frame building with dimensions of about 45 ft. x 60 ft. The timber for this building was cut at the site and from the surrounding land by church members where the construction was done under the supervision of Elder John C. Torrence. The timbers were fastened together with wooden pegs driven into holes. The entire structure rested on large stones shaped by stone masons who quarried the rock from ledges or nearby outcroppings. In the interior there were six large round columns equally spaced to support the ceiling and overhead timbers. The interior of the building contained an alcove for the pulpit and two sections near the pulpit, one of which was called the Amen Corner and it is thought that the choir sat in the other. There was also a section separated by a waist high curtain from the remaining portion. This was near the rear which would have been where the slaves sat. The one room sanctuary was heated by two cast iron wood burning stoves placed in the center aisle. Light was provided by kerosene lamps, six over the congregation and one over the pulpit. The structure had five doors, two on the north and two on the south with the main entrance being on the west which opened into the sanctuary. Two worshiping communities continued to share the site until on September 12, 1864 Olney Presbyterian Church petitioned the Concord Presbytery to join with the Independent Presbyterian Church at Olney. The merger was completed on September 12th, 1865. The building previously used by the Independent Church at Olney became the building the merged congregations used. This building remained essentially unchanged for the next 65 years. The shell of that building remains as the interior sanctuary of the current church although modifications have been made throughout the years. Much of Olney’s early history is marked by periods termed “silent years” where there are few if any records which remain. The period from 1799 until the recorded Session minutes of 1839 is essentially blank. On July 17, 1839 data was entered into a Session book, but the next entries do not occur until August 29th and 30th of 1840. A notation in church records indicates that the church was desegregated until 1865 when the freed slaves left to form their own church according to a transcribed record from a remnant of Session accounts. No record was entered for the name or place of the church formed. There is then a gap between this entry and the next one which occurred on August 28th, 1852. This sporadic recording of Session minutes continued for some time, although there seems to have been an active congregation and a Session which oversaw the conduct of the members even during these times when no formal records were kept. Services were conducted by ministers shared with other congregations whenever they could come and services were often multiple day events. The covered entrance seems to have been added around 1900. There were some interior changes as well when a library and a small ladies parlor were partitioned off from the sanctuary. Small windows were added in the west end and on the south side where one of the doors was closed. 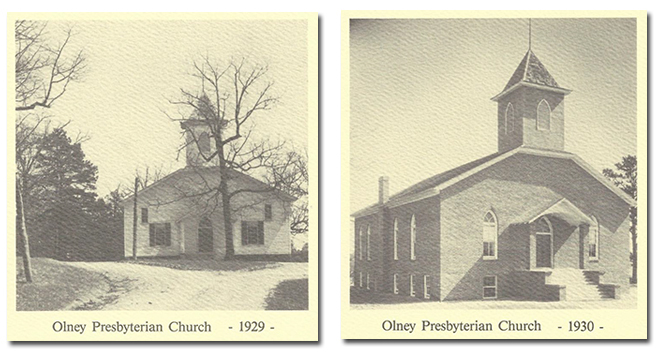 Until 1922 Olney had never had a full time pastor, but on March 1, 1922 the Rev. T. G. Tate accepted a call for full time ministry there. He remained at Olney for 21 years, leaving in 1943 to accept another call. Although there were three previous manses, there was not one on the church property until a manse was built in 1922 on the church grounds. Rev. Tate and his family was the first to occupy it. The construction of this manse caused the relocation of the Session House to the rear of the property. In 1927 the church had grown to a membership of 297. By 1929 a steeple and bell had been added to the exterior of the building. The congregation at Olney continued to grow in size during the ministry of Rev. Tate. There were three young people’s groups formed (Senior, Intermediate and Pioneer). In 1929 the congregation voted to remodel the church building, adding an education building by jacking up the current church and digging out a half basement underneath. 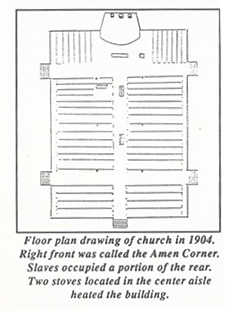 Twelve Sunday School rooms with a wide hallway where fellowship meals and meetings could be held were created. Restrooms and a furnace room for the installation of central heat were included in this project. The exterior of the church was brick veneered at this time. The steps on the south and west sides of the church were built up, widened and brick veneered to conform to the architecture of the church. On February 28, 1930 a service of dedication was held where Rev. Tate officiated. The congregation held annual Sunday School picnics either on the church grounds or in a city park. In 1944 additional changes were begun for the exterior with the addition of a bell tower situated in the middle of the front of the church. This addition necessitated the removal of the small steeple. The floor level of the bell tower became the vestibule for entrance into the sanctuary and a stairway entrance to the basement level. Changes were made to the interior as well. The Sunday School rooms which had been built at the rear of the sanctuary were removed to provide more seating space. At this time the large wooden columns of the original construction were removed from the center aisle, squared and encased in the outer walls with plaster, their locations still visible. The two original north side doors and the remaining south side door were closed. The pulpit was moved forward to make room for a choir loft which had two sections with the organ and piano placed between them directly behind the pulpit. In 1946 fifteen colorful stained glass windows were installed, one above the main entrance, two in the bell tower vestibule and the remaining within the sanctuary. Fourteen of these windows are memorials to former members of the congregation. In 1947 the two story educational building was constructed. 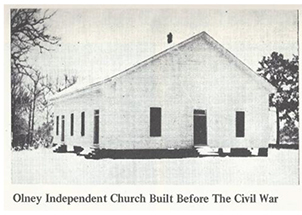 This addition gave Olney more basement level rooms, an assembly (Fellowship Hall) room, more restrooms, a pastor’s study, two choir assembly rooms, another furnace room for heat, a ladies parlor and a kitchen. The construction was begun in February and completed in December. In 1968 the sanctuary was again renovated. Ceiling tile was installed on a level lower than the overhead beams and the pulpit and choir loft were altered. The pulpit was moved out of the alcove in order to accommodate the installation of a new pipe organ and sound changer built directly behind the pulpit and choir. In 1973 the physical appearance of the church was changed again with the addition of a white steeple erected and positioned on top of the bell tower. In the mid-1980’s protective coverings were placed over the stained glass windows to protect them from breakage. In 1989 an elevator was installed on the north end of the educational building to provide an alternate access through the Fellowship Hall to the church sanctuary. A covered canopy was added at this entrance to provide shelter for loading and unloading in inclement weather. During this same period the church offices were relocated to the basement. In 1993 in preparation for the 200th Anniversary celebration two pews were removed from the front of the sanctuary to make room for handbell tables, new carpeting was installed and the restrooms were remodeled and modernized. 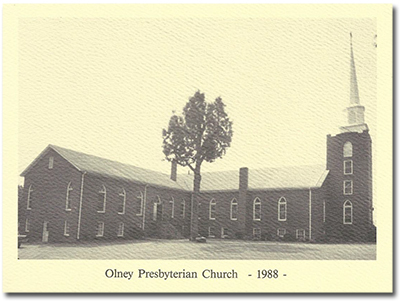 Olney hosted the Presbytery of Western North Carolina meeting on July 24, 1993. In November of 2009, the congregation voted to remodel the vestibule and sanctuary. The choir loft was rearranged so that the organ and piano were moved from between the two sections and a single front facing seating arrangement was created. The pulpit was moved from the center to one side of a raised platform and the Communion Table was placed in the center. The ceiling was lowered again to its present level. As accurately as can be determined, the forefathers of this church called it Olney right from the beginning. Only they knew the source of the name and unfortunately no records exist to shed light on its origin. There are some good theories that fit into Olney’s pre-organizational dates that could be accepted as historical fact. There is a definite connection. Rev. John Newton was curate (clergyman in charge of a parish) in the Church of England from 1767 to 1780. Newton, known for his evangelistic fervor, wrote the popular hymn, “Amazing Grace.” He was also a close friend of the poet, William Cowper, who settled in Olney, England in 1767. Cowper contributed hymns to the “Olney Hymns,” a book of gospel hymns that was popular in the church for generations. Mr. Lingle and Mr. Tate theorize that the influence of John Newton and William Cowper could have caused the adoption of the name Olney by this congregation. It is likely that copies of “Olney Hymns” were used by the Olney congregation here. 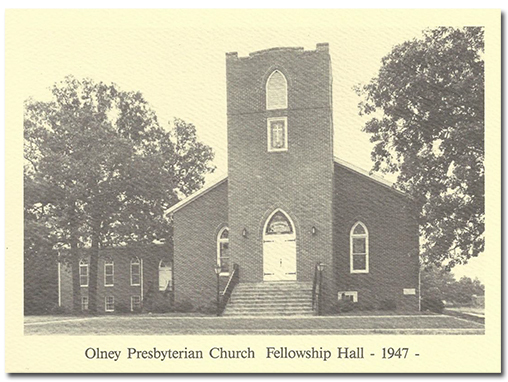 Being evangelistic in spirit, the influence of the hymnbook and its name, “Olney” could have been the influential ingredients to cause this congregation to use that name. That theory is also supported by Dr. Charles E. McCartney, former pastor of First Presbyterian Church in Philadelphia, Pa. He points out that there is a church in Philadelphia named Olney Presbyterian Church but it was organized in 1898. He says it was probably named for the district Olney in which it is located. However, the district was likely named after Olney, England. The name Olney, is not so uncommon. Many towns and cities in the United States still use this name. From Robert L. Hallman’s history of Olney published in 1993 as part of the church’s Bicentennial Celebration. 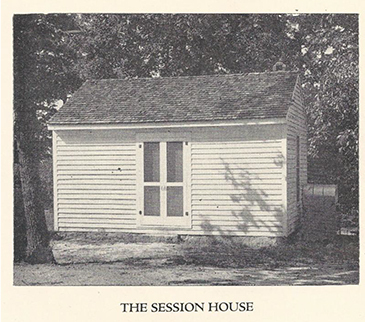 The exact date when Olney’s Session House was constructed is not known as no records exist of its construction. However, it seems that the Session House may actually be the oldest structure on the church’s property. Some evidence exists that the white frame structure was built when Olney was still a mission point of Bethel Presbyterian Church. If that is accurate, then it predates the organization of the church itself. The next date likely for its construction is when those who became the congregation of Olney were worshiping there under a brush arbor shelter. The first official mention of the Session House occurs in Session minutes of 1859 when William Holland’s successful bid was recorded for placing a new roof on the Session House, indicating it had already been in use for many years. The building is constructed of heart pine lumber fastened together with wooden pegs. It originally had both a fireplace and chimney. The original purpose was to conduct church business. It was where people came to confess their faith and were examined for membership in the church community. It was also where church members who were accused of wrongs or straying from church doctrine were examined and if needed, reprimanded by the Session. It was originally located where the current manse is buT was moved to the rear of the church property in 1922 when the first manse located on the church property was built. It has been moved twice in the period since 1922. It has been used for storage, as a pastor’s study, a Sunday School classroom, a mini-museum and is now a historical museum.